I've finished this after the photo was taken -- had to purchase more quilting thread for the final border. I ended up NOT quilting the ribbon at all and like how it appears to be laying on the surface of the quilt. And this is my pieced backing, having promised myself to use what I have, rather than buying NEW. I may try cutting my backings at 10 1/2 inch or 12 1/2 inch squares from left over fabrics, and see if that type backing might be more attractive. But let's face it - ONE or two large NEW pieces are MUCH less work than piecing 48-64 squares for a backing ... (Elaine, be strong and stick with that plan!). Funny you should mention backings. I just got back from Joann Fabrics after purchasing 9 yards of fabric for the back of the Firewood quilt. I wanted to use all the same fabric for the back of this quilt so the seams won't show too much. This looks nice. I agree that piecing squares takes more time but think of how virtuous you will feel when you use that fabric from the stash! I love the 10 1/2" squares for backings. A scrappy front with a scrappy backing is like having a reversible quilt. I love the ribbon border on this quilt. when I grow up I wanna quilt like you. Fabulous quilt. Bet that feels good to be finished! I have been piecing backs from fabric on hand. I have too much fabric to use up to go buy new every time. But be warned, sometimes the backs take as long as the fronts! Congratulations! Your quilt is beautiful. 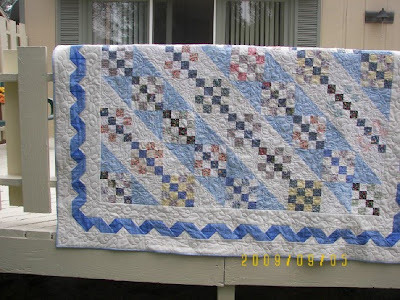 I think your border quilting solution is a great idea. I've pieced backs many times. I started one with the 10 1/2 inch squares and got 2 or 3 rows done before I started adding big chunks. It just took too much work! I like pieced backs, but Marcie is right - they can take longer than the front! I have a PILE of really UGLY fat quarters that I am going to cut into 10.5" squares for backing - but only because I think it is a good way to use them. Your backing looks fine. Mary of Heartstrings often uses an off-center 4 patch back that looks really nice too. The quilt looks beautiful. I've done a few pieced backings, but more for effect than to use up fabric. They do take a lot of extra time, though. Beautiful quilt. I guess when you piece the backing you just have to pretend you are starting another new quilt. I do love pieced backings. Love the quilt! I have a very large quilt that I made years ago and I pieced the back from crappy fabrics from my stash. I cut them into very large rectangles (probably about 12 x 15) I pieced them into rows with off-setting seams - like bricks. I think I even arranged the fabrics in colors so that the colors made a diagonal pattern. Anyway, it used a lot of yuk fabric and actually looked pretty good in the end. Quick and not too many pieces! Beautil quilt. It looks so old fashioned and comfy. I agree...I have no wish to piece the backing too...although I have done that on hte Wizard of Oz backing on the White Chocolate quilt. Your Furrows & 9-patch turned out great. I really like that ribbon border and may have to try it one of these days. This quilt is so beautiful. I want to make one like it. The ribbon border is great - I have a ribbon border on one of my UFOs. It does add a nice touch. I think you should take whatever scraps you have to make your backing. No sense cutting up fabric in pieces just to sew them together again, but no sense in going to the store to get more either. I have to be careful though, there are times when I like the back better than the front! I'm starting to piece more backs, and while it IS more interesting than a solid back, you're right about the work. It's like making two quilts in one. I tend to favor a stripe down the back located about 2/3 of the way over. I make the stripe of squares, strips or blocks, and sometimes add borders to it. 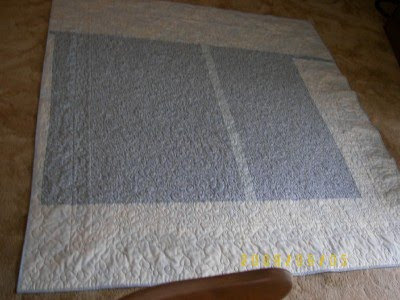 This is a great way to stretch a single width of fabric into a whole backing for a quilt wider than 40". And they are fun to design. I absolutely LOVE the quilting & the ribbon is perfect! The Furrows and Four Patch is just wonderful. I really like the soft colors you've used and border is just right. I have made that same border! I still have the pattern somewhere. I should try it again. Thanks for reminding me! Mmm, didn't this turn out lovely? I so love the ribbon in the border. When you first glance at it the eye sees a Ribbon Cut Border. Amazing! And I like the idea of a pieced backing as well. Just haven't tried that yet. Lazzzy. But If you can be strong and stick with that plan maybe I can, too! Funny that I came across this post about your back....I had 3 quilts I determined to do the backs for this week...well, here it is Sunday and not a finished one in the bunch. I started cutting 12 1/2" squares using the left over fabrics from the top for one of them and it is like sewing up another whole quilt...and then I got caught up in the design look and then... well, you get the picture. I sure like the ribbon desing you used for your border...lovely! !